My stomach hurt. It wasn't from the bloat I usually develop as a typically lactose-challenged Latina and, at 48-years-old, I can assure you it wasn't menstrual cramps. The hurt came from nerves. Those weren't mere butterflies fluttering around inside my belly. No, I had encountered a full blown invasion of bees, Killer Bees. Let's make that South American Killer Bees -- just like the ones I seen on Saturday Night Live as a kid. Those bees, led by John Belushi and Elliott Gould, were funny. The ones in my stomach weren't. I was in pain. And why, exactly? Because that evening I was scheduled to speak in public. It's not like I haven't engaged in public speaking before. As a writer, I've spoken to an audience of one (an appreciative college student at the University of California, Riverside) and to a stadium of thousands (drunken college students from the main stage of Lollapalooza in 1994). However, this time I was scheduled to speak in my home county of Ventura and where my family was to be present. Yes, my family. The same family who had offered such loving support for my earlier public presentations as a young girl: "Mi'ja, we are so excited to hear you recite, 'Twas the Night before Christmas'!" but the same family who prompted doubt and shame: "Next time you need to stand up straighter! Project your voice! And NO chewing gum!" But, hey, I reminded myself, it was March 8th, International Women's Day! 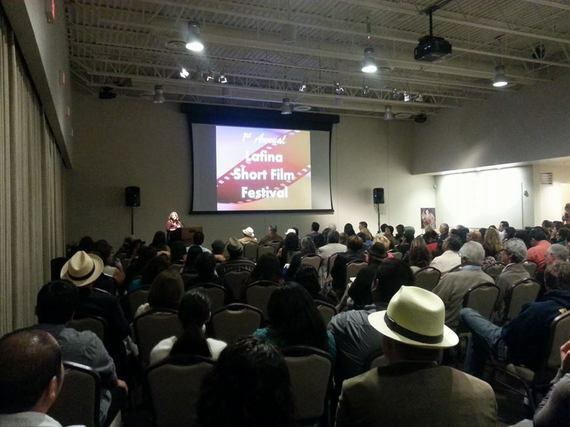 And, hey, I had been requested to speak at the First Annual Latina Short Film Festival hosted by the Museum of Ventura County. I was no longer a little kid in baggy tights and braids softly reciting Clement Clarke Moore. I was now a woman. Yes, a woman, God dambit! One who has traded in her tights for Wolford stockings and her braids for short platinum blonde hair. And, to add, a woman who had traded some old man's Christmas poem for what she wanted to say -- alongside other women, brown women, not only to express ourselves, but to celebrate our opinions and art in an institution often facilitated by, yes, men. Ladies' Night, indeed. Ladies' Night, I mean the Latina Short Film Festival, started out wonderfully. During the museum's reception of champagne and aperitivos (also known as hor d'oeuvres in other cultures), I had many family members come up to congratulate me and my fellow Latina artists and presenters. What had I been worried about? Director Lucy Rodriguez-Hanley's short film, The Big Deal, based on a story from my book, How to be a Chicana Role Model, was the inaugural film shown, followed by a recognition from the museum and my address to the audience. From the podium, my anxiety kicked in again. The audience of 300 suddenly swelled to the size of a football field. Wait, enough of male-oriented comparisons. Let's say the audience multiplied to the size of ten Jazzercise classes. As I became more nervous, I relied on an old trick I learned in a community college speech class. But I didn't just picture my family in their underwear. After all, they were now members of a Jazzercise class and were all waiting for the next cue in their in fluorescent spandex and metallic gold unitards. The visual helped. I began to share how it had been challenging as a young girl, a young Latina, to assert my voice in a household and in a community where female expression was a no-no. I learned early how to keep opinions to myself, to keep everything inside. I concluded my talk by stating the importance of such a film festival and, after a thunderous applause of Flick Kicks and Turned Out Triplets (remember, they're still in Jazzercise class), I took my seat to enjoy more artistic endeavors by my Latina colleagues. The film When I Grow Up by Tejana director Sharon Arteaga (who also won Best Director) was followed by Josefina Lopez's newest short, Fifty One Fifty. Josefina Lopez is best known as the screenwriter of the 2002 film, Real Women have Curves. Defined as a "Chicana feminist horror film," Fifty One Fifty depicts a young woman held in a mental facility who undergoes an exorcism. The topic and scenes of the film immediately frightened me. Another part of my cultural conditioning: you just don't mess with the devil. (Full confession, I feel scared for even typing the "D" word right now). "That film was ugly! What does it have to do with the arts?!" I immediately recognized the voice and sunk into my folding chair. The voice belonged to Uncle Filiberto. Make that Grand Uncle Filiberto. Not only has Grand Uncle Filiberto been a member of the Oxnard Knights of Columbus Council 750 for over 30 years, but he has held office as a Knights of Columbus Grand Knight. Double Grand whammy indeed. The moderator awkwardly acknowledged Grand Uncle Filiberto's interruption and continued with the program. But I could no longer focus. I could still hear his voice, that questioning male voice I was all too familiar with. Was he actually scolding a woman's work in public? Questioning a Latina's form of expression, shaming her on... International Women's Day? I wish I could think of a less clichéd Biblical historical reference of how the family took sides to Grand Uncle Filiberto's actions that evening. Maybe I'm just making up for typing the "D" word earlier, but the division was truly like the parting of the Red Sea. I tried to stay neutral -- out of respect for my tio and respect for a fellow Latina artist, but I felt conflicted and embarrassed. I half-expected John Quinones and his camera crew from What Would You Do? to pounce on my timidness. But in all actuality, I partly worried how the other attendees, museum members, and the filmmaker herself would react to my uncle speaking out of term. Seven year earlier, I had been in a position similar to his. In 2007, I had attended an art opening where a local white woman portrayed Ventura County farmworkers at work. One of the paintings, of a Latino farmworker hoisting a basket of jalapeños, bothered me. The painting was titled Jalapeño Man. Having family who have worked in the fields and orchards of Central California, I would be heartbroken if one of them had been portrayed with such a name to an audience of flute-slinging art collectors. Not wanting or knowing how to question the artist's approach or decision, I left the art opening without saying anything. After all, it was a night of celebration and maybe I just didn't get it. Days later, some of the images, especially Jalapeño Man, still bothered me. I drafted a letter to the local newspaper to voice my concerns. I spent much time rewriting the letter, wanting to be respectful to the artist while suggesting there might be a cultural and spiritual disconnection between her and the subjects in many of her paintings. Within day, after the publication of my letter, more letters were published -- vehemently against what I had written. My letter was deemed by one reader as "an accusation so trite as to be meaningless" and that I only saw what I wanted to see. The authors of all the letters opposing mine were white, like the artist, and defended her and her work. The private emails I received, supporting my feelings and sharing the same sentiment of my letter, were all written by Latina/os. I felt horrible. Like Grand Uncle Filiberto's outburst, my family's feelings about my published letter were divided and protective: "Aren't you worried about that letter you wrote?" a female cousin had sighed. "That all these people will hate you?" I continued to feel horrible. But mostly I began to feel sad. What good did my formal education at UCLA in Chicana/o Studies and courses in Feminist Theory do for me if I, along with many women in my family, still feared and regretted the consequences of speaking up? Albeit reactionary and poorly timed, I somewhat envied Grand Uncle Filiberto's unadulterated bravado. I mean, I wish I could do what he did, just jump up and say what I think without a care in the world. Whereas I tend to contemplate for days over an issue, But after backlash of my published letter, maybe such an approach isn't correct either. Grand Uncle Filiberto had asked what did Josefina Lopez's film have to do with the arts, but he didn't remain for the entire program to ask her himself. In my letter to newspaper I had asked what the artist's images were trying to convey, but I never received a direct reply. Would Grand Uncle Filiberto have spoken so abruptly if Fifty One Fifty been written and directed by a man? A white man? Would I have written a letter to the newspaper if Jalapeño Man had been painted by a Latina? That evening, Josefina Lopez took home the award for "Best Film," and Grand Uncle Filiberto took off early. And me? I took another Pepto Bismol tablet.